As yet another examination of the blurry line between creativity and madness, Séraphine paints a portrait of an inspired, tortured artist whose genius is compromised by the rigors of external judgment and acclaim. Among the plethora of pop culture parallels, two contemporary comparisons sprang to my mind. First is how superior this decorated French film from director Martin Provost is to the pandering, exploitative Jamie Foxx vehicle, The Soloist, about a classically trained musician whose schizophrenia consigns him to living homeless on the streets of Los Angeles. Second, I was struck by the striking similarities between Séraphine Louis (1864-1942), also known as Séraphine of Senlis, and English singing sensation Susan Boyle. Each is dowdy, eccentric and blessed with raw artistic talent that eventually outshines the superficial ridicule of others. And, most poignantly, both had difficulty coping with the pressure of achievement and unexpected celebrity. 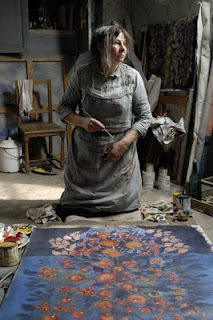 Séraphine (Yolande Moreau) was a lowly French washerwoman who, when not wandering the forest and conversing with natural spirits only she could seemingly detect, used her sparse sous to indulge her love for painting naive—and later, Naive—still-lifes of flowers and fruits. Her work was discovered in 1914 by Wilhelm Uhde (Ulrich Tukur), a German art critic and collector. A homosexual Jew living in pre-World War I Europe, Uhde saw in Séraphine not only as a repressed genius, but a fellow outsider. Uhde helps Séraphine attain praise and financial success she is ill-equipped to handle. He also proves an inconstant benefactor, twice abandoning his protégé, due to WWI and, later, the Great Depression. In this respect, Provost skillfully—and accurately—avoids casting Uhde totally as either a saint or a parasite. Provost makes the interesting decision not to primarily focus on Séraphine’s work, but on Séraphine herself. His principal implement is Moreau, whose already award-winning performance is restrained but expressive, capturing Séraphine’s inner tumult without a hint of showiness or condescension. While we learn little about Séraphine’s life pre-Uhde, Moreau manages to convey insight into the gifts and pain stirring beneath a frumpy mass and sagging visage. What we are left with is a sometimes moving, occasionally distressing, but always fascinating depiction of Dionysian virtuosity. Nevertheless, it is worth considering whether Provost intends Séraphine as merely a biopic or also as a broader commentary on the way outside influences, economic and otherwise, corrupt the purity of art and artists. If the latter is his true aim, he ignores the irony that this movie—which cost money to make and requires money in order to see it—would not exist if Séraphine’s celebrated paintings were not still hanging in galleries throughout the world.